At the Detroit Auto Show, the luxury automaker Mercedes shared its all new Mercedes Benz E-Class 2017. Presenting some fancy interior stuff and state-of-the art technology, the model is speculated to take over the Audi market. 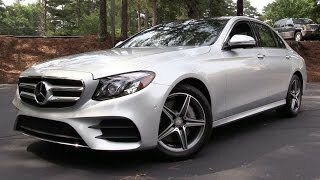 Let us have a look at the review of Mercedes Benz E-Class 2017 to know in detail about it. The interior of Mercedes Benz E-Class 2017 is primarily based on the S-Class, so you can be sure that the interior’s going to be luxurious, comfortable and an impeccable experience. The dashboard features the same massive touchscreen mounted in center while the four A/C vents beneath it will give you a cleaner sight. The instrument cluster gets a new look and now features two analogue gauges and a seven inch screen between them. It is shared that the high-end trims will have a huge 12.3 inch screen between these two dials. Talking about our former screen, the inclusion comes paired to 8.4 inch touchscreen while the latter will be pairing to another 12.3 inch screen housed over the center stack. Talking about the new three-spoke steering wheel, it comes with some touch sensitive controls and gives the cabin a high-end look. 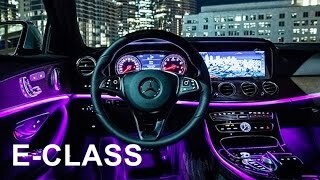 Apart from these the LED interior lighting and the command rotary dial with leather and wood trim work, make the interior of Mercedes Benz E-Class 2017 look truly luxurious. Just like the interior, exterior of Mercedes Benz E-Class 2017 carries similarities with the luxurious S-Class sibling. Starting with the front fascia it has newly clustered set of headlights while between them is the traditional grille. The spectacular swooping roofline and mind blowing character lines along the sides will undoubtedly mesmerize you. Moving towards the rear end you’ll notice the taillights that carry similarity with the C-Class sibling while the bumper is almost similar to the one at the front end. The three point star on the hood further add to the glory and make the model look truly gorgeous and take the model beyond any comparison. 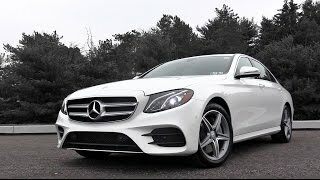 Thus rounding up the exterior details of Mercedes Benz E-Class 2017 all I would say is, it is gorgeous and has everything to steal the gleam while rolling down the lane. The powertrain of Mercedes Benz E-Class 2017 is still not shared, however company did unveiled the power output of E300 (a model in the class). The model will be housed with a 2.0 liter four-cylinder engine cranking total output of 241 hp and peak torque of 370 nm paired to 9G-Tronic nine-speed automatic transmission as standard. The performance figures of Mercedes Benz E-Class 2017 are still not shared but we expect to have them very soon.